Why should you make Moving Connections your local Midvale movers? First of all, Moving Connections is a local professional moving company that is federally licensed and insured. Second, Moving Connections is an affordable moving service that has its roots in Northern Utah. Third, Moving Connections has been providing moving services along the Wasatch front for more than thirty years. Fourth, Moving Connections fields the best professional moving crews who are conscientious, clean, and courteous. Fifth, Moving Connections is in the moving business for real with support services such as climate controlled storage and home staging services. We even provide crating, palletizing, and air freight shipping services at very reasonable prices. Sixth, Moving Connections provides different levels of “Labor Only” service for those who want to save some substantial money on their move. Click on the tab below that describes the moving service that you’re looking for to get more details on the services we offer. Full service residential moves are Moving Connections’ most popular local moving service. That’s because we consistently receive great reviews from customers who have used our service. And the reason we get such good reviews is that we hire the best, most experienced movers for our moving teams. Moving Connections has been serving the Salt Lake Valley area for more than thirty years, providing excellent local and interstate moving service. And we’ve learned a thing or two about providing a good experience for our customers. For example, our straightforward pricing policy – time plus materials used (we don’t charge for stretch wrap, and we don’t charge anything for blankets, pads, or equipment that we keep in our possession) – is as clear and unambiguous as it gets. We don’t charge any junk fees or surcharges or taxes. Just time, tape, and boxes. If you’re looking for a money-saving deal on your move, consider renting a moving truck yourself and letting a Moving Connections professional moving team wrap, pack, and load your truck. They’ll load it to the highest professional moving standards so that your items won’t shift or bounce against each other. Then you can drive the truck to your new destination and unload it yourself there. Or, if you have some particularly heavy or bulky or especially fragile items, you can hire a labor only team at your new city to unload these items. Just be aware that there are minimum charges with most companies. Either way, you stand to save a lot of money by driving your own rented truck to your new location. You can even do as much of the packaging as you want to save even more. Just know that “customer packed” items are not insured. If Moving Connections is moving you to Midvale it's a perfect time to begin to utilize the many resources and bounties of Midvale. For example click on the picture to the left to go the Moving Connections 'Support - Advice - Assistance' page and discover Midvale for the first time. Once you are on the 'Support - Advice - Assistance' page go ahead and open the .pdf link found there and tape the list of emergency and useful phone numbers on your refrigerator. 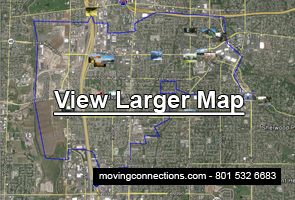 Moving Connections has gone to great pains to find those links and connections to integrate you quickly into Midvale life. Moving Connections has handled every size of business move, from small office moves within the same building to large scale corporate relocations involving multiple crews and multiple trucks. So we know how to move businesses in the safest and most efficient manner. Although Moving Connections is federally licensed, bonded, and insured, we are very affordable with fair and transparent pricing – you pay for our laborers' time plus non-reusable materials (boxes and tape). We don’t charge for stretch wrap, though we use a lot of it. And we have no added fees or surcharges or taxes.